Has Microsoft locked HTC out of Windows 8? Apparently Microsoft has given HTC the cold shoulder when it comes to Windows 8, as some insiders claim that the software giant has overlooked the mobile manufacturer in favour of bigger companies. Several companies are preparing hardware for the official release of Windows 8 in October, with the likes of the Asus and Acer being among the early adopters. But according to sources familiar with the matter, Microsoft has chosen not to include HTC in its plans for the Windows 8 roll out. The sources claim the reason for Microsoft's decision is that it's concerned that HTC doesn't sell enough devices and it has little experience when it comes to making tablets. 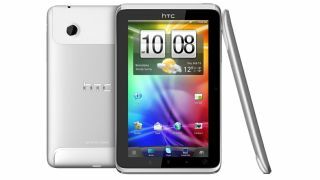 HTC hasn't managed to cover itself in tablet glory as its only effort, the Flyer, received a muted response and it's set to miss out on the potentially lucrative Windows 8 tablet onslaught. The Taiwanese firm is currently having a bit of a rough ride, reducing its sales forecast by 13% for the second quarter of 2012 – which suggests that even smartphones like the One X and One S can't get HTC's devices shifting.